RICHARDSON IS NOT IN THE CONGO. CONGOLESE NEWS ACCOUNTS TO THAT EFFECT WERE INCORRECT. Bill Richardson is reportedly in Kinshasa on behalf of the National Democratic Institute to help negotiate a peaceful resolution to the disputed election. Richardson is known in Congo as the guy who tried to persuade Mobutu to step down in 1997, as Kabila's Rwandan forces bore down on him from the east. It's not clear why Richardson isn't working under the auspices of the State Department instead of NDI. I had heard rumors that he would be named special envoy, but that seems not to have come through. Richardson, who had to withdraw his 2009 nomination as Obama's choice for secretary of commerce when it came out that he was under investigation for pay-to-play dealings, has recently conducted parallel track diplomatic efforts in several global hot-spots, including Cuba, Sudan, and North Korea. A former congressman, governor, and cabinet officer, Richardson brings considerable political heft to his assignments, regardless of who his official sponsor is. The task confronting Richardson now is to prevent post-electoral violence in Congo from becoming a run-away chain reaction. Tensions are high, especially in the capital Kinshasa, where incumbent president Joseph Kabila looks likely to be re-elected under a cloud of suspicion and resentment. The main opposition figure, Etienne Tshisekedi, says that the election was rigged. He is extremely popular in Kinshasa and has intimated he might encourage his supporters to riot in the streets. But he has also said he would accept the election results if they were properly tallied. This should provide the opening Richardson needs. He should encourage Tshisekedi to hold off doing anything rash by promising to conduct an audit under international certification. This will be difficult, given the chaos of election day, but it should be possible to compare the district-by-district totals to the final tally counted by CENI. Richardson should work with Tshisekedi to find someone, preferably a retired African leader, who's capable of credibly heading this job, given proper technical support. Of course, Richardson would also have to persuade Kabila to allow such an audit to proceed. That should not be particularly difficult. After all, it's in his best interest to dispel doubts about the legitimacy of his victory. And it's not as if the West is entirely without leverage here. It should also be possible to re-do the vote in those (several dozen) districts where logistics or political chaos prevented it. Finally, Richardson needs to persuade the international community to gin up the money necessary to conduct this audit. The amount it would take is reasonably small, and easily justified on preventive grounds. Dispatching a few dozen expert vote-counters for a couple of weeks is a cheap price to pay to prevent the sort of cataclysm many now fear for the Congo. The Congo won't turn into Cote d'Ivoire, where two armies clashed following a disputed election. For one thing, Tshisekedi doesn't have an army, unless you count the legion of young men who see him as their spokesman. But Congo could see days or weeks of violence ahead, along the lines of what happened in Kenya in 2007. 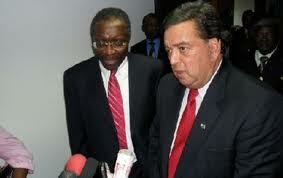 Richardson is NOT in DRC and is not working as a mediator on behalf of NDI. This is a poorly-sourced rumor that's been spread by Congolese press without verification.